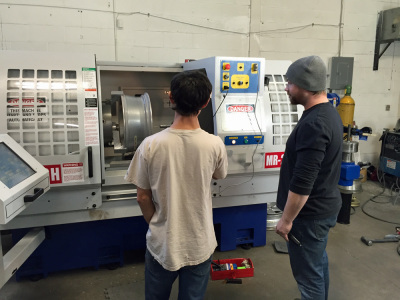 In many machine shop practices, there have been questions about the purchase decision between a horizontal lathe and a vertical lathe. 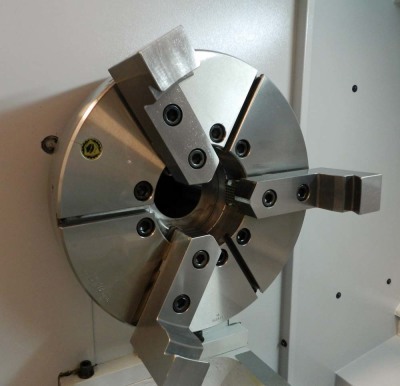 The matter of the fact is that CNC lathes come to the market place with different sizes and are available at both horizontal type and vertical type. 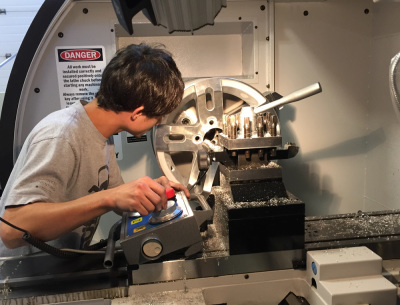 When using a vertical lathe, a machinist must work in an UP & Down motion. When using a horizontal lathe, a machinist works in a Side to Side fashion. 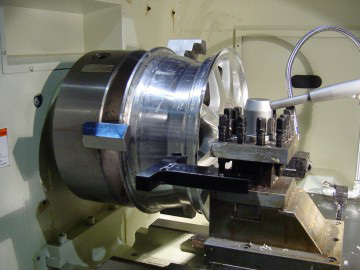 The question is : Which type of lathe works better as wheel repair CNC machine ? Here is a picture for a vertical CNC lathe from which you can see how the job would be handled with UP & DOWN positions all the time. 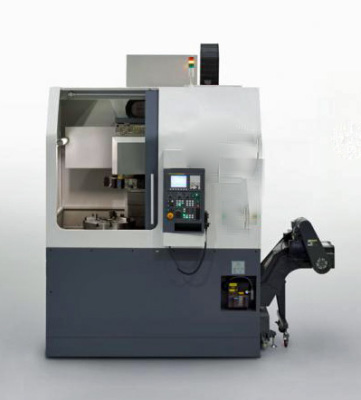 One vertical type CNC lathe which is designed for wheel refinishing work as shown. All work must be carried out fully in UP and Down positions. 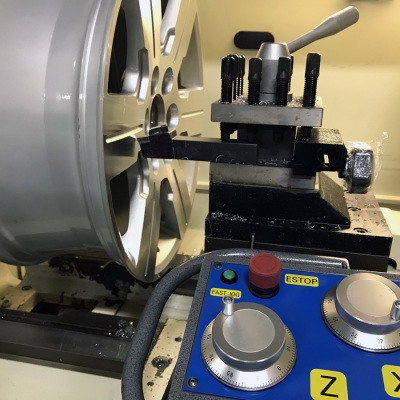 For Lehigh diamond cut wheel repair CNC lathe, the choice is very simple and very clear based upon wheel repair shop applications. 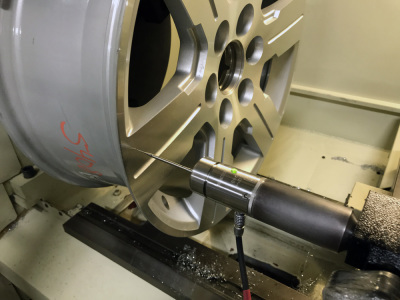 With horizontal type lathe setting, it is easy to install and remove alloy wheel. 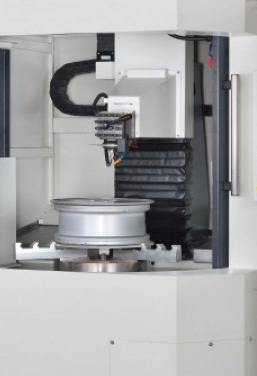 And it is easy to digitize the wheel, easy to do trial-run and easy to machine wheels on diamond cut CNC lathes. 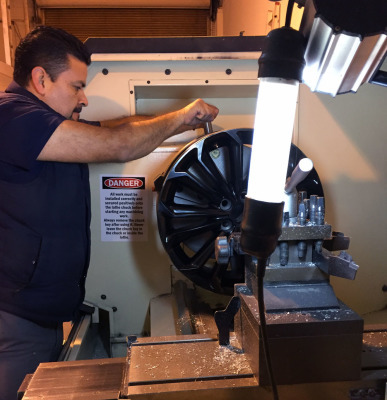 For many wheel repair shops in USA, the wheels to be machined from one Lehigh Hi-Tech wheel repair CNC machine can be more than 100 each day. With horizontal type of setting, it is every easy to install or remove the wheels, much easier and much faster than the installation from any vertical lathes. The work position and space are very comfortable with Lehigh wheel repair machine. The operator can easily lock down and secure the wheel on to the lathe chuck. With horizontal lathe setting, the operator can visualize and inspect all details during the work procedure very comfortably. Optimized position setting for digitizing on Lehigh wheel repair CNC lathe machine with horizontal type. Operator can easily inspect all details right in front of his eyes without bending his body down all the time. 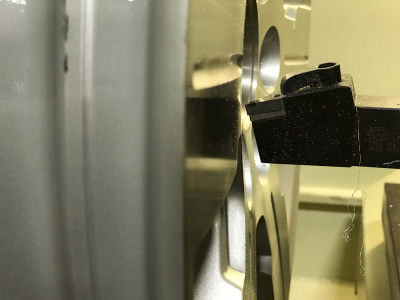 For many wheels, the operator needs to move the wheel in the middle of the digitizing to prevent the stylus from getting into holes on the rim surface. 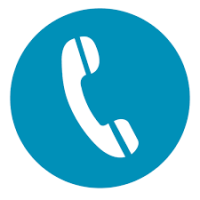 The digitizing process requires the operator to watch carefully during the entire process in order to keep the probe on the solid surface all the time. On many alloy wheels, the typical path is NOT straight line. Instead, it may be of curved style quite often. The operator may have to pause the digitizing and move the wheel position slightly to ensure the probe to be on solid wheel surface. On a horizontal type lathe, the operator can easily inspect the digitizing procedure step by step since everything is under his watch by looking ahead. And everything is within his reach if he has to turn and adjust the rim position during this procedure. By comparison, this procedure would be very difficulty if one is working on a vertical lathe. The probe hardware is now on the other side of the machine far away from the operator. It is much harder to work with this kind of setting. Another very important step for working on Hi-Tech Wheel Repair CNC Machine is to do trial-run before actual machining process. In this process, the operator should watch closely to make sure that the cutting insert will follow the digitized profile from the starting point to the finishing point without any deviations. If it does, then, the operator should make the adjustment right there. To carry out this procedure, it is natural for operator to see the wheel mounted in vertical position, which works perfectly on a horizontal lathe like Lehigh Wheel Repair CNC Machine. However, it will not work on a vertical lathe where the alloy wheel is laying down instead. With horizontal lathe setting, it is very easy for operator to visualize and verify the accuracy of the origin setting in the process of trial run before diamond-cutting. Optimized work position and work space on Lehigh wheel repair CNC machine provides the operator the most desirable work environment. 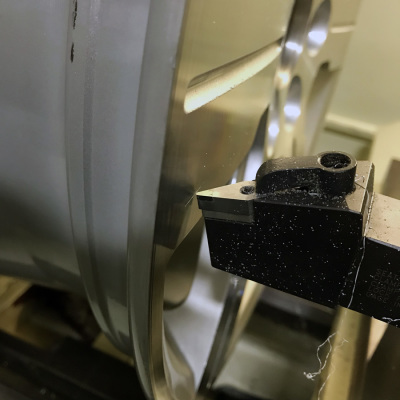 After making the adjustment, the cutting tool tip matches perfectly with the wheel surface profile during the trial run before actual machining. 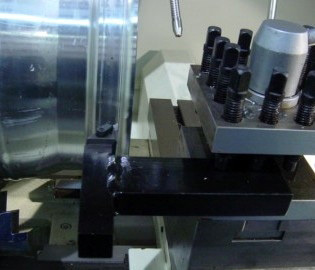 During the trial run on Lehigh Hi-Tech Wheel Repair CNC lathe machine, when the operator sees a gap between the cutting tip and the rim surface (refer to the first picture above on the left), he should make the adjustment so that the cutting insert touches the wheel surface (refer to above picture on right) and continue this trial run all the way to the finishing point accordingly. Again, everything works perfectly on a horizontal type machine for trial-run. It will be very difficult for a vertical lathe. The back-lip area can be machined with clear views from operator’s position on Lehigh wheel repair CNC lathe in horizontal type. 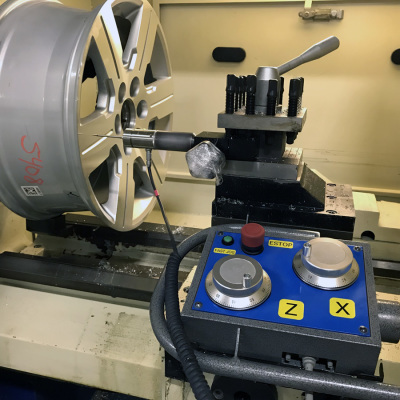 Both sides of the back-lip area of above alloy wheel have been machined from Lehigh wheel repair CNC lathe. Lip cutting program is applied on Lehigh wheel repair CNC machine with an easy hard to imagine until witnessed. 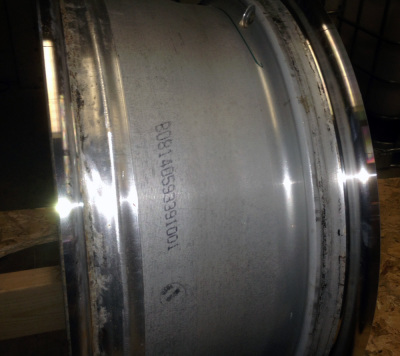 One of the common wheel repair application is to refinish the back-lip area after doing the welding jobs. Some people call this as lip cutting which is needed for all production wheel repair shops with welding capacity. Again, it is natural to do it on a horizontal lathe. Please refer to above pictures for the working position of the special cutting tool holder made for lip cutting applications. With horizontal lathe setting, the operator can make his observations without any doubt. And it is very easy to do a trial run before the actual machining as well. However, this would be very difficulty task again on a vertical lathe since the cutting tool would be on the opposite side of the operator. The fact that the cutting tool insert would be below the wheel surface prevent the operator from cutting the lip safely. From practical point of view of wheel repair CNC machine applications, Lehigh Diamond Cut CNC lathe has all the reasons to remain the horizontal type setting. This is a very easy decision to make without any doubt. All the customers who have purchased Lehigh wheel repair CNC lathe machines are very happy to work with the settings on our wheel repair CNC machine. 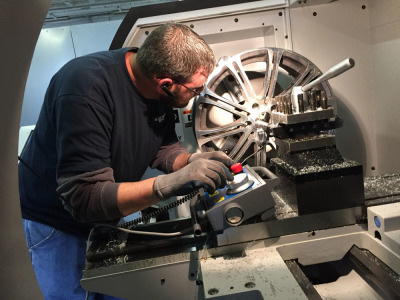 Many companies have purchased more than one Lehigh wheel repair CNC machines due to the heavy productions. 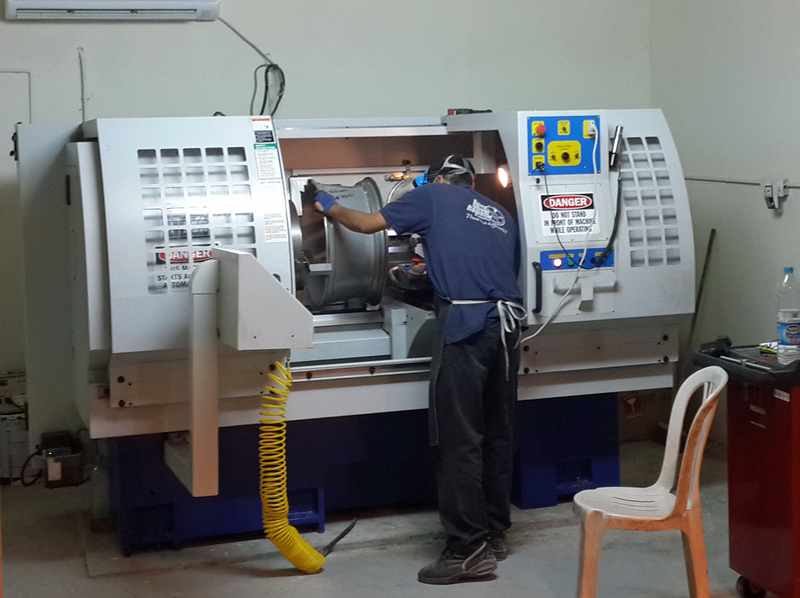 Some company has (4) MR-2540 CNC lathe in one shop.